Will the utility industry make the investments in smart grid based largely on avoided costs alone, and will they do it a timely manner or over many years? Smart grid investments often require large upfront costs relative to their benefits. However, future benefits may come at small incremental costs. Utilities and regulators may need to look at full system life cycle costs and benefits in order to fully justify added investments. Some of the benefits may come in the form of societal benefits which will need to be clearly understood and evaluated. Payback periods may be longer than stakeholders would like. The service providers, regulators, and ultimately ratepayers are going to have to believe it before such substantial investments are made. Public Utility Commissions (PUCs) analyze and determine if proposed utility infrastructure investments, like the deployment of Smart Grid technologies, are prudent investments. Investments are often evaluated based upon actual and realizable benefits, and while future benefits may be considered, they must be evaluated appropriately. The state-by-state PUC approval process could create a patchwork approach, as different Smart Grid improvements could be adopted by neighboring states or even utilities within one state. The Federal Energy Regulatory Commission (FERC) is seeking to provide an interim rate policy under which jurisdictional public utilities may seek to cover costs of Smart Grid deployments before standards are adopted through a rulemaking. It recognizes that a key issue for utilities in deciding whether to invest in Smart Grid technologies may involve the potential for stranded costs associated with legacy systems that are replaced by smart grid equipment. On March 19, 2009, FERC proposed a rate policy for the interim period until interoperability standards are adopted. Smart grid investments that demonstrate system security and compliance with Commission-approved Reliability Standards, the ability to be upgraded, and other specified criteria will be eligible for timely rate recovery and other rate treatments. This rate policy will encourage development of smart grid systems. State utility commissions need to develop interim rate policies to accommodate costs of smart grid deployments in areas where the states have traditional jurisdiction. Generally, before state commissions approve a utility’s AMI deployment plan, the utility must first demonstrate a positive cost-benefit business case for its proposed AMI implementation. For many utilities, a positive business case requires including projected savings from demand response. 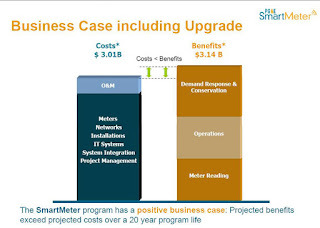 A large fraction of AMI costs (ranging from 50 percent to 90 percent) can be justified by a reduction in traditional utility costs of operations or improved services, such as avoided meter-reading costs, faster outage detection, improved customer service, and better management of customer connections and disconnections. Projected benefits from the demand response enabled by the AMI system may be included to bridge the cost-benefit gap based on what is recoverable from AMI-operational savings alone. Why do we need to pursue the consumer side (smart meters) before Smart Grid upgrades are made to the distribution system? Why can’t many of the benefits that Smart Grid provides be done with existing technologies, e.g., existing demand response technologies? All consumers will pay for Smart Grid investments, but only some will (can) take the initiative to achieve the full set of benefits. Is that fair? Will consumers have to purchase additional devices to participate with the Smart Grid and enjoy its benefits, e.g., home area networks, in-home displays? Will Smart Grid technologies increase the risk of cyber security breaches resulting in a less secure grid and the leaking of private consumer data? Smart-grid technology offers a wide range of possibilities, so deployments will vary depending on each utility’s business needs, existing infrastructure and regulatory environment. Some utilities may seek to use the technology to maximize energy efficiency, while others may focus on the integration of renewable energy sources. Capital Assets – Included in the rate base when they are used and useful. They earn a return, which is set in a Cost of Capital Case and are depreciated. These items are reviewed in general rate cases, although large additions may warrant a separate filing Expensed items are recovered without a return. Authorized competition, after a century of monopoly, still requires “regulation” for licensing, fraud prevention, access to bottleneck facilities, prevention of affiliate abuse, and assurance of last resort service. If effected incorrectly, the result of “deregulation” is still "regulation," except that it is regulation of the market by the incumbent to protect its position, rather than regulation of the incumbent by the commission to protect consumers. ERRA - Energy Resource Recovery Account – Set through annual CPUC proceedings to determine fuel and purchased power costs on a forecast basis. The revenue requirement is spread over forecast sales. Revenues are recovered through balancing accounts with future adjustments for revenue over-or under-recovery, which can be due to errors in forecasting costs or sales, including response to DR events. Utilities may make trigger filings if actual revenues differ from forecast by more than 5%. There are annual ex post reviews of past ERRA cases. EUI - Energy Use Intensity - A measure of total energy use normalized for floor area. It is used to compare the energy use of different buildings. Whole-building energy use is measured in kBtu (1000 British thermal units) per square foot, per year, to standardize units between fuels. Electricity use is often expressed as annual kWh per sqft per year. Intervenors - Most state public utility commission proceedings allow others with an interest to “intervene” in order to present their point of view or question the proposal. Neighbors, communities, environmental groups and other utilities are typical intervenors in proceedings. In most states, these groups do not have access to funding from the state or the utility applicant and must raise their own funds to pay legal and expert costs. Some states, like California, do offer intervenor funding. Performance Based Cost Recovery Model - Regulators in both Oklahoma and Ohio have approved performance-based smart grid cost recovery approaches. IOUs forfeit some or all of their returns if anticipated O&M savings are not achieved. At the same time, they get the opportunity for returns above the authorized rate if actual O&M savings are higher than anticipated. There are many other potential performance metrics that could be considered, including distribution line losses, demand response per customer, and reliability. Capital investment does not (by itself) make a grid smart. The value comes from the manner in which utilities make use of smart grid data and capabilities. Therefore, performance-based cost recovery would better motivate IOUs to pursue the difficult and critical organizational, operational and regulatory changes required to maximize smart grid value than the traditional capital investment incentive approach. Public Advocate - Forty-two states fund a public advocate office that represents the public in cases before the state utility regulators. In many states, the public advocate can hire experts and can bill those costs to the utility applicant, generally subject to review by the utility commission. Public advocates usually have people on their staff who are experts on utility regulation and participate in reviews of utility plans, with a particular focus on the rate impact of new investments. Consumer advocates also intervene in cases before the Federal Energy Regulatory Commission. PVRR - Present Value of Revenue Requirement - Derived by subtracting the operating and capital revenue requirements from the market value of generation, assuming that the unit end of life is extended in one year increments. Calculated by subtracting fuel, O&M, environmental emissions cost, and on-going and CAI capital revenue requirement cost from revenue similar to a merchant plant valuation. Prudency of investments: This can be broken down into decisional prudence i.e., was the decision to invest in smart grid reasonable given information known at the time and operational prudence i.e., did the utility build and deploy the investments in a timely and reasonable manner. Used and useful: Investments must be useful for the purpose it was intended once recovery of costs begin. Equity in allocation of costs and risks refers to the amount of risk (and in turn, cost) each side to the bargain must bear. Typically utility investments are undertaken as a need is identified and the cost to address that need is minimized. Single Issue Ratemaking: Utilities are generally required to “net” all costs and benefits of operation at the time rates are set to avoid cherry picking individual cost increases that may be offset by other cost decreases. Stranded Asset - An asset that is worth less on the market than it is on a balance sheet because it has become obsolete in advance of complete depreciation, such as electric utility meters that are replaced by newer meters before the existing ones would normally have been retired. Given our nation’s population growth and the exponential increase in the number of power-hungry digital components in our digital economy, additional infrastructure must be built – smart or not. According to The Brattle Group, investment totaling approximately $1.5 trillion will be required between 2010 and 2030 to pay for this infrastructure. The Smart Grid holds the potential to be the most affordable alternative to “building out” by building less, and saving more energy. It will clearly require investments that are not typical for utilities. The utility industry has historically been regulated for prior investment, the transformation to regulation for value delivery promises to stimulate substantial progress and alignment around the Smart Grid vision and implementation. However, regulators will continue to require a showing that the value of the investments to consumers ultimately exceeds the costs. Smart grid development must compare incremental costs directly with incremental functionalities and avoid the double-counting of benefits. Ratepayer investment in Advanced Metering Infrastructure should be matched by private sector investments to develop in-home HAN technology. Customer preference of data access frequency should not result in additional AMI system hardware costs to ratepayers. Market competition for HAN-enabled home energy management solutions may provide lower-cost strategies than utility programs. The smart grid should support a sustainable and competitive market for independent demand-side management products and services. Avoided Cost of New Generation - the most recent Department of Energy combustion plant cost of $670/kW. Avoided Cost of New Distribution - $250 /kW from Rand Study While $250/kW is likely to be a reasonable average cost of distribution across the U.S. (though the cost estimates are now somewhat low since the data were developed a decade ago), distribution costs vary widely across utilities. 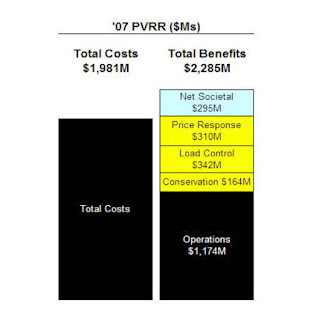 For instance, the distribution cost for Con Edison from the original study is more than $1,500/kW. Enabling the "Connected Home” Customers will be able to program smart appliances and devices to respond to their energy use preferences based on cost, comfort and convenience. Keeping the Lights On - Information provided by the new "smart" meters will inform smart grid operators when an outage occurs and how extensive it is, enabling a faster response for quicker service restoration. Cost Effectiveness: The cost effectiveness analysis contained in these applications is based on a Consensus Framework proposed by most of the parties in R.07-01-041. This framework is not as broad as the subsequent protocols proposed by Commission staff, which required a sensitivity analysis of many inputs rather than a single benefit/cost ratio for each program and test. However, it does provide a useful estimate for examining the cost effectiveness of programs. Track record of performance for continuation of existing programs: This includes, but may not be limited to, actual load drop (especially compared to enrolled load and estimated load drop), target groups and types of participants, actual cost, how often it was called, actual load drop rate, actual load pick-up rate, and other factors as appropriate. Projected future performance: Expected performance in the future including, but is not necessarily limited to, estimated participation (customers and enrolled load) and estimated load drop at peak times. Flexibility or Versatility: Whether a program can be called under a variety of circumstances, or only in very rare or specialized situations. For example, does the program have multiple triggers? Can it be called on a price responsive basis for simple day to day resource dispatch, as well as for contingency matters such as emergencies? Can it be called in non-summer months to respond to generator outages? Adaptability to changes in the structure of the electricity market: Ability of a program to adapt to the Market Redesign and Technology Upgrade (MRTU) and the new CAISO markets. For example, is a program likely to be able to supply some of the operational characteristics of Proxy Demand Resource or participating load? What interaction or shared dispatch and control could CAISO have with the program? Locational value: Whether the program can be called by location. For example, can the program be activated (“called”) by specific location if necessary, particularly in transmission and distribution congestion areas? Does the program help to alleviate a particular geographic challenge? Does it count towards locational resource adequacy or more specific local needs? Integration with advanced metering infrastructure, Smart Grid, and emerging technology: What enabling technologies are required for the program? Would this enabling technology become obsolete or redundant once AMI is installed at the participant customers site? Will the program increase the operational capability of AMI? How might the program contribute to a Smart Grid? Consistency of offerings throughout the state: Are equivalent programs available in or appropriate for other parts of the state? Is the program consistent enough across utilities that commercial customers with multiple facilities can participate easily? Simplicity/Understandability: Can customers understand how the program operates and what is expected of them? Customer acceptance and participation: Are participating customers likely to recognize that the program had been called? Is participation likely to cause customer hardship? Can the customer override an event – if so what does the utility expect will be the rate of customer override? Environmental benefits: Does the program have any particular environmental benefits that other programs do not have? Does the program help with firming intermittent renewable energy? Is the program consistent with statewide goals or policies? For example, will the program simply shift usage from peak to another time or does the program also reduce overall usage? Is it integrated with other demand-side programs? Does it result in significant greenhouse gas (GHG) reductions? Cost – is among the most significant challenges facing development of a smart grid, with estimates for just the electric utility advanced metering capability ranging up to $27 billion along with the regulations that allow recovery of such investments. Stranded Assets - Regulators are struggling with approving IT investment that will be obsolete long before the 20-40 years utilities traditionally expect. Strong interoperability standards are necessary to ease upgrading and minimize "stranded assets." For detals see my blog article Standards for Standards. Comprehensive Meter Program Costs - $500 for each residential and small commercial customer, $5,000 for medium commercial customers (between 20 and 200 peak kW) and $20,000 for large commercial customers. These costs include utility costs of developing the infrastructure required to support real time pricing, load control and other programs along with equipment and installation costs. Avoided Cost Recovery - Under the current regulatory environment, the utilities' avoided costs would not normally be a problem if they had to incur them without investing in smart grid. This is because any new generation and transmission investment to handle growth in peak demand and total energy consumption is historically always recovered by customer rate increases approved by regulators. So, there may be a lack of incentive for utility companies to make smart grid investments on a huge scale. Financial Incentives - Regulatory reform may be necessary to provide more immediate financial incentives for utilities to invest in smart grid, otherwise smart grid may be deployed over an excruciatingly very long time to get implemented to every customer. Adding extra charges to customers' bills to explicitly pay for smart grid as envisioned by many as a way to fund it won’t be very palatable with customers if those charges become excessive relative to an average utility bill. There would be huge political opposition to massive charges added to everyone’s bills. The traditional modes of motivating an IOU to invest capital in its distribution system – providing a fair rate of return on shareholders’ equity – do not necessarily motivate an IOU to maximize the value of smart grid investments. For the past century or so, investor-owned utilities (IOUs) have been authorized by their regulators to earn a rate of return on equity sufficient to attract investors and fund capital investments. This arrangement assumes that infrastructure investment is useful for customers. In distribution, this has traditionally held true and is fairly black and white: Capital investment is needed when loads and customer counts grow; when switches and transformers fail; and when billing software becomes obsolete. In fact, the value of investing into the distribution business has long been considered a given; as long as improvements are needed, are fairly procured, and are appropriately commissioned, the new assets are deemed ‘used and useful’ and are allowed into an IOU’s rate base for cost recovery. Smart grid assets are altogether different in two ways. First, the decision to invest is optional and not generally related to immediate needs. Second, the value delivered is highly variable and almost wholly dependent on the actions a utility takes during design, implementation and optimization phases of deployment. Poor business cases in isolation, high initial investment when integrated. In the metering and distribution automation environments, basic Smart Grid functions tend to have poor business cases by themselves. Examples of such functions are simple automatic meter reading, or feeder fault location and auto-restoration. While nobody can deny their intrinsic value, these functions typically do not provide enough return on investment to justify building the communications networks needed to deploy them over a wide area. If utilities are to argue for cost recovery project by project rather than by single integrated plan, some beneficial aspects of deployment of a smarter grid could be lost. Integrated plans are being proposed and considered. In California, smart meters only became economic when the commission considered non-utility benefits – benefits to consumers from lower bills. Many early adopters of Smart Grid philosophy have discovered that when several Smart Grid applications are deployed together, the integrated business case becomes viable. For instance, when basic meter reading is combined with meter-aided outage management, theft detection, and prepayment and/or real-time-pricing, it is easier to justify an AMI deployment. Similarly, when fault location is combined with phasor measurement and real-time state estimation, the business case for transmission or distribution automation becomes clearer. Nevertheless, these more advanced features require bigger up-front investment. The higher initial investment of integrating advanced Smart Grid applications may present a challenge to many utilities. Lack of Support from Consumer Groups - Watchdog Groups such as TURN and DRA do not support SmartGrid rate proposals from California three major ISO’s. 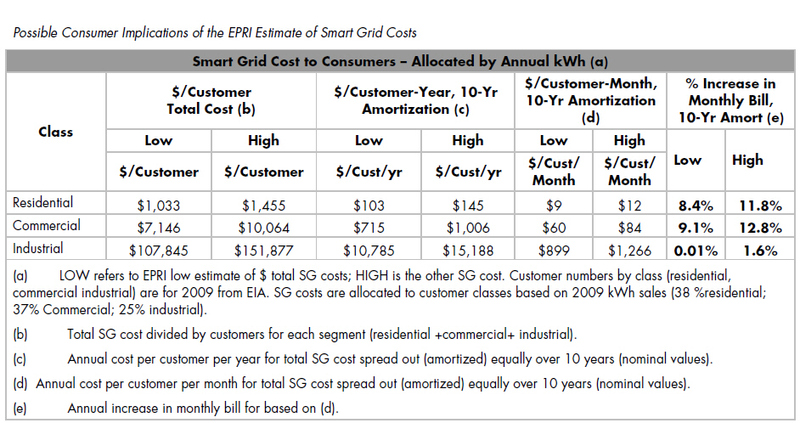 Benefit Quantification - The value of Smart Grid technologies has been difficult to quantify in a simple cost-benefit analysis due to the multi-tiered benefits they provide to the utility, the consumer, and society. Comparative financial metrics are difficult to achieve because each utility incorporating Smart Grid technologies has put a unique level of investment in a variety of technologies. First Adopter Risk - the rewards—financial, operational, experiential, and otherwise—for first adopters are not generally recognized by other electric industry stakeholders. Long Payback Period - Utilities must grapple with making Smart Grid investments, knowing that significant utility and consumer benefits may not occur for several years. A Smart Grid is a complex, comprehensive, and integrated monitoring and operating system; it will provide publicly observable benefits only after considerable investments have been made in upgrading the infrastructure of the nation’s utilities and the monitoring and control devices in the homes and businesses of consumers. Investing in equipment and personnel training, for which there are few short-term benefits, creates operating costs that may be difficult to justify without policy direction and support from government agencies. Patchwork of Regulation - Utilities are regulated at the state level which means 50 different and often conflicting sets of rules that apply to an even more diverse industry made up of 1,200 state regulated utilities plus 2,000 municipal utilities with their own regulations. Federal regulatory oversight is limited to the interstate transmission of electricity and a few federal utilities such as the TVA and Bonneville Power Administration. No Bid Contracts - The current paradigm allows IOUs to contract single third party vendors. This structure impedes competition and innovation in customer-focused smart grid products for in-home energy management. Microgrids - Have to rethink cost attribution based on usage with microgrids. A level playing field between utilities and third parties will promote California’s goal on Energy Efficiency Market Transformation. Entrepreneurial Culture- Regulated utilities have traditionally been reactive, with no need or incentive to be proactive on a national level. Well aligned for utility operations, they are not necessarily well positioned for integrated strategic initiatives like the Smart Grid.Currently, regulated utilities and their flat-rate customers have no risk or reward signal. Regulation makes it difficult for them to raise rates and recover costs, and makes them reluctant to change. Since the technology and value propositions are emerging, utility companies may be reluctant to expend the significant amount of capital required to move toward a smart grid, especially because expected cost-recovery timelines are only theoretical and have no precedent. Cross-Subsidation - The US Government Accountability Office (GAO) is asking the FERC to consider cross-subsidization – passing on to consumers the cost of transactions between utility companies and their affiliates. By reading about multi-state regulatory requirements, GAO concerns get multiplied as cross- subsidization complexity increases by involving several states regulators in one utility application. Public Utility Commissions and regulatory staffs of the utility companies sit down with their bosses and agree to put the social benefits of upgrading the infrastructure into their business case. For a smarter grid to benefit society, it must reduce utilities’ capital and/or operating expenses today – or reduce costs in the future. DRA – Division of Rate Payer Advocates, San Francisco, CA – Public Advocate in California An independent consumer advocacy division of the California Public Utilities Commission (CPUC), Part of the California PUC Our statutory mission is to obtain the lowest possible rate for service consistent with reliable and safe service levels. In fulfilling this goal, DRA also advocates for customer and environmental protections. TURN - The Utility Reform Network, San Francisco CA - Utility watchdog that stand up for consumer rights, affordable rates and a more livable California. For more than 30 years they have challenged California’s powerful energy and telephone companies, saving consumers and small businesses millions, and demanding reliable service and environmentally sound policies. On June 21, 2010, the Maryland Public Service Commission rejected BG&E’s bid’s to install smart meters to 1.2 million customers across its service territory and institute mandatory TOU pricing in summer months, the PSC said in an order issued yesterday. Financial risk to the utility’s customers is just too big, the regulators said. The PSC found the business case for BG&E’s smart grid proposal “untenable” but invited the utility to submit an alternative proposal that addresses the commission’s concerns. BG&E estimated the plan would cost $482 million during the initial deployment period and an additional $353 million over the expected life of the program. The timing of BG&E’s proposal was motivated by DOE awarding BG&E a grant of $200 million for smart grid investments. Concerning the TOU proposal, the PSC said BG&E’s application contained no detailed customer education plan, included no commitment to installing in-home displays and provided for “grossly inadequate messaging … to trigger the behavior changes contemplated under the proposal.” Some of the utility’s most vulnerable customers -- including low-income people, elderly folks and those with medical needs requiring electricity are less likely to realize the benefits of TOU pricing than average customers because they cannot shift use to off-peak hours. The PSC concluded the nature and magnitude of the uncertainties underlying the utility’s business case raise serious doubts about whether the proposal was a cost-effective means of reducing consumption and peak demand of power in Maryland. GE Energy Services argues the Maryland PSC and other state commissions must be prepared to allow utilities to earn a return on their investments in smart grid through a surcharge or another rate mechanism. Otherwise, utilities will opt to build costly new generation and transmission lines to meet demand growth in lieu of deploying smart grid technology. The National Energy Marketers Association agrees with the conclusion that mandatory TOU at this early stage of a consumer’s understanding of the pricingstructure could be fraught with problems. GridWise says that Regulators should not reject a comprehensive smart grid project simply over concerns about a particular rate structure. On April 13, 2012, the Michigan Court of Appeals on Thursday overturned a state Public Service Commission (PSC) decision to allow DTE Energy a $37 million rate increase to pay for smart meters. The court said DTE hadn't provided enough evidence to justify the rate increase. "We will not rubber stamp a decision permitting such a substantial expenditure – a cost to be borne by the citizens of this state – that is not properly supported," said the written opinion of the three-judge appeals court panel. The court also told the PSC to investigate the benefits and possible burdens of smart meters. The court said "At best, the actual evidence presented by Detroit Edison to support the rate increase was aspirational testimony describing the (smart meter) program in optimistic, but speculative terms." DTE states that the Michigan Court of Appeals ruling raised procedural questions about the documentation of costs associated with an advanced meter pilot program in 2008. The Court of Appeals did not reject the costs or say they were improper, but rather sent the issue back to the Michigan Public Service Commission (MPSC) for additional review. The MPSC is currently doing a thorough analysis of advanced meters, and DTE anticipates that the program will be seen as a great investment that is bringing numerous benefits to their customers. The court ruling affects a $217.4 million increase for all customers the PSC approved for the utility in 2010. The MPSC said in January that it would investigate the use of smart meters by DTE and other utilities in the state. In October 2011, the Illinois Legislature overrode Gov. Pat Quinn’s veto of the legislation that critics say guarantees ComEd and Ameren utilities yearly rate-hike increases for each of the next 10 years.ComEd, which will invest $2.6 billion to upgrade its electric system in the next decade, contends that it is now the nation’s first utility to have its profits tied to performance, and that it will be penalized if it fails to live up to its agreements to operate an efficient and reliable power system. As part of its plan, ComEd will install 10 “smart” electric substations over the next five to 10 years to better predict, find and resolve power outages. Improve outages by 20 percent and the duration of outages by 15 percent. Reduce Northeastern region frequency of outages by 20 percent. This area includes the north and northwest suburbs, which were devastated by storms this past summer. Improve the total number of customers who exceed the service reliability targets by 75 percent. Cut the number of annual estimated electric bills by 90 percent. Reduce consumption on inactive meters, a cost borne by all customers, by 90 percent, and reduce by 50 percent electricity theft. CPUC - Decison Adopting Demand Response Activities and Budgets for 2009 through 2011 (pdf) - Date of Issuance 8/24/2009 - The total adopted budget for all three utilities’ demand response programs for 2009-2011 is $349,509,463. This decision adopts a budget of $188,806,349 for SCE, of which approximately $38.8 million will support the aggregator contracts adopted in this decision. The total adopted budget for PG&E is $109,060,072, and the total adopted budget for SDG&E is $51,643,042. Utility analysis by Jackson Associates shows that nearly all utilities will save enough in avoided costs with a comprehensive smart grid deployment to at least cover smart grid development and deployment costs; however, many utilities barely break even. For example, about 10% of utilities achieve benefit/cost ratios less than 1.2 and should be considered at risk of incurring costs that are greater than benefits given uncertainties concerning actual deployment costs. More than one-third reflect benefit cost ratios less than 1.5. Customer-detailed analysis shows, however, that all utilities can significantly improve returns on smart grid investments by targeting individual market segments with specific technologies.